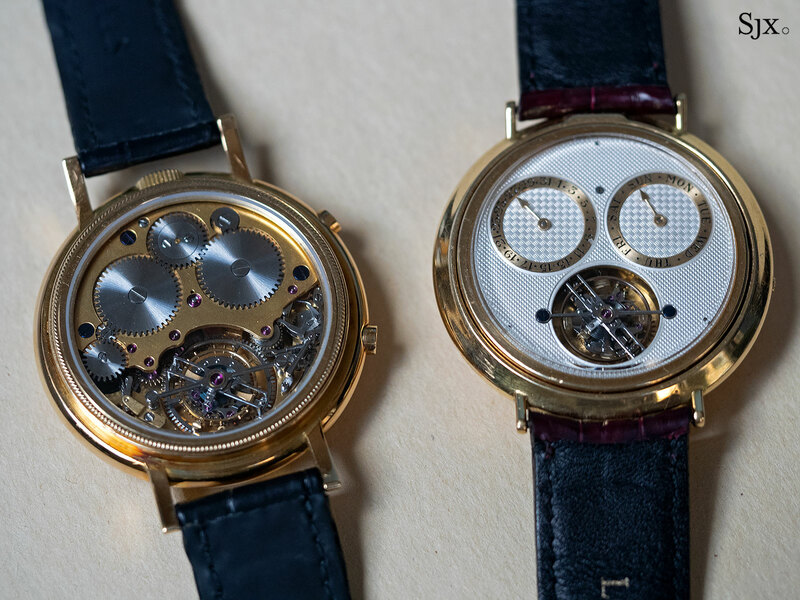 Four-minute tourbillon and compact chronograph. 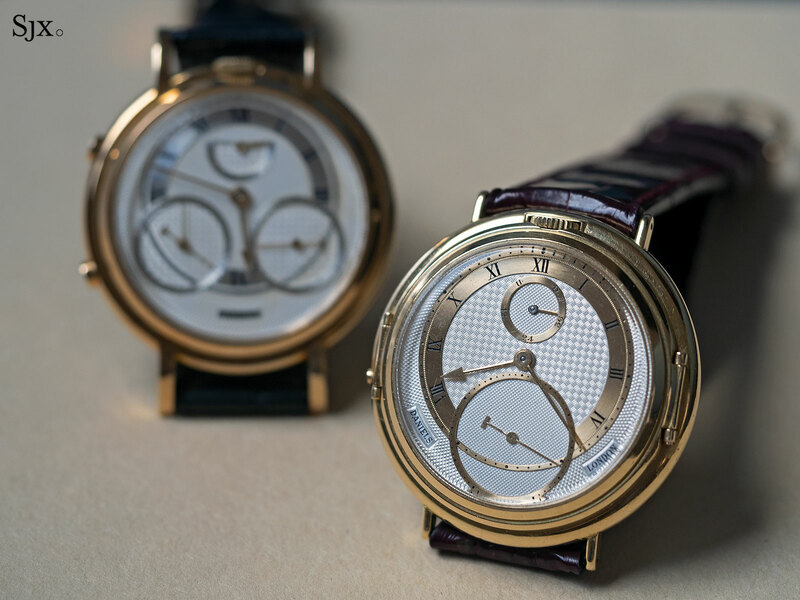 The first wristwatch George Daniels ever made in a career that spanned over 50 years was the Chronograph Wristwatch (and the second was the inventive and perhaps more lyrical “Spring Case” watch). 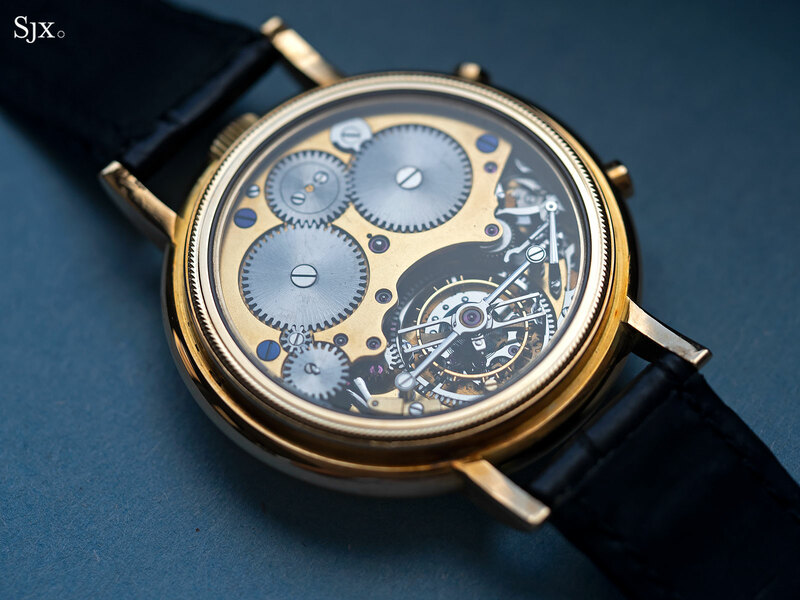 It was finished in 1991, though Dr Daniels had worked on it for several years, having used it as part of a display at the 1986 Baselworld trade fair to exhibit the use of his Co-Axial escapement in wristwatches made by various brands, including Omega, Rolex and Patek Philippe. 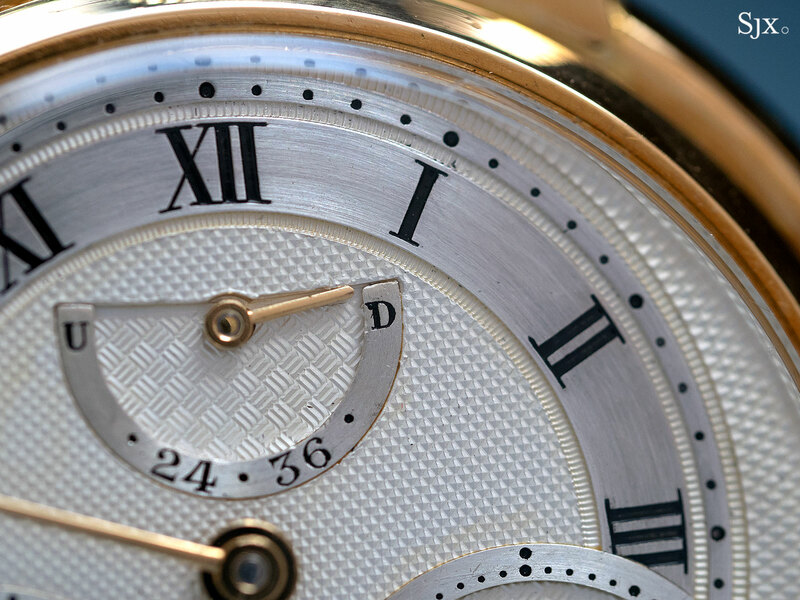 Despite its modest name, the Chronograph Wristwatch is a masterpiece. 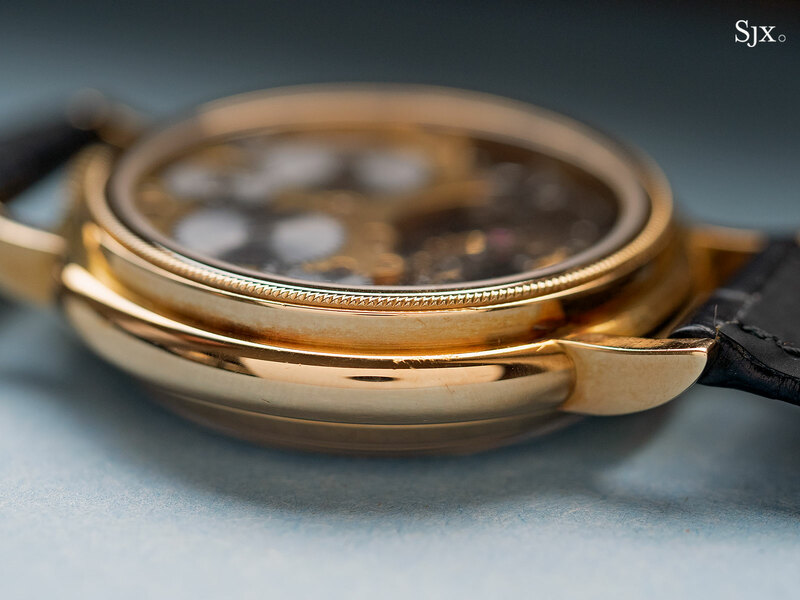 The late Dr Daniels’ apprentice, and now master watchmaker in his own right, Roger W. Smith serviced the watch not too long ago. 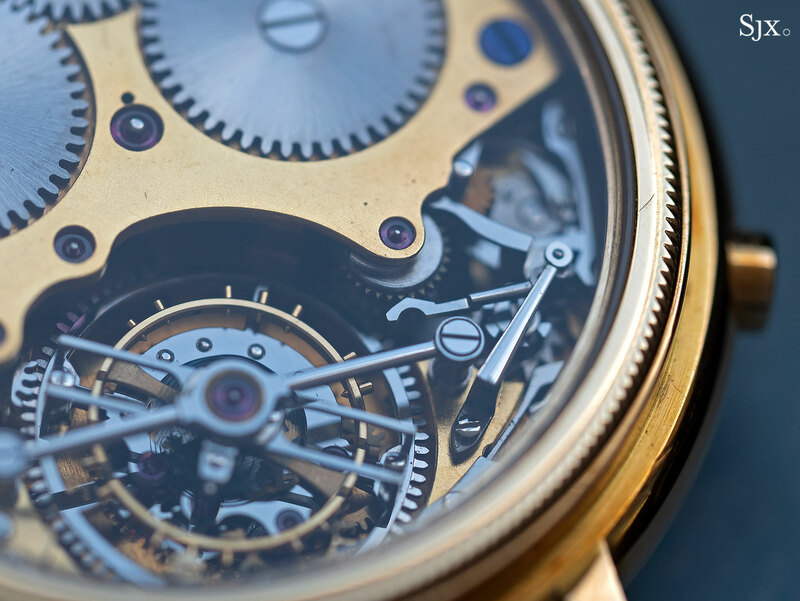 It is worth remembering that the Chronograph Wristwatch, like all of Dr Daniels’ one-off timepieces, was hand-made with manual tools, from movement to case. 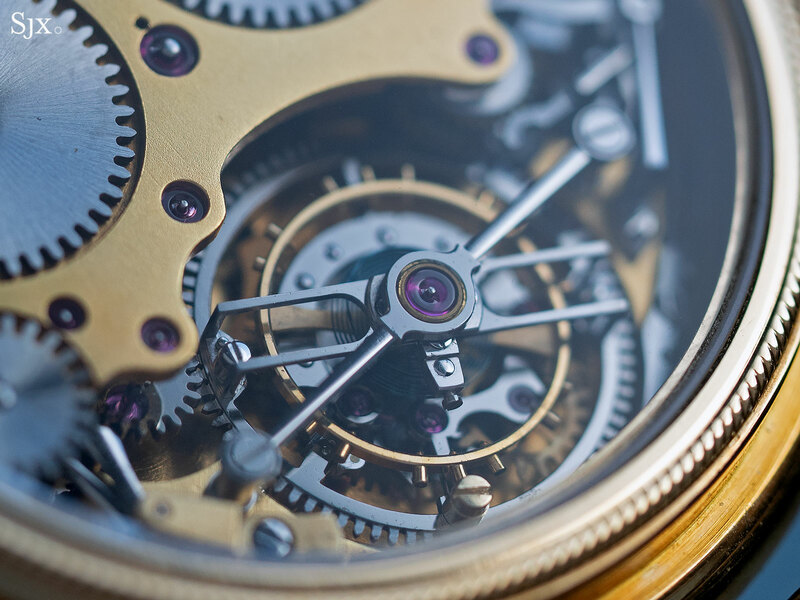 Consequently, it exhibits both mechanical inventiveness as well as the peculiarities of a hand-made timepiece. 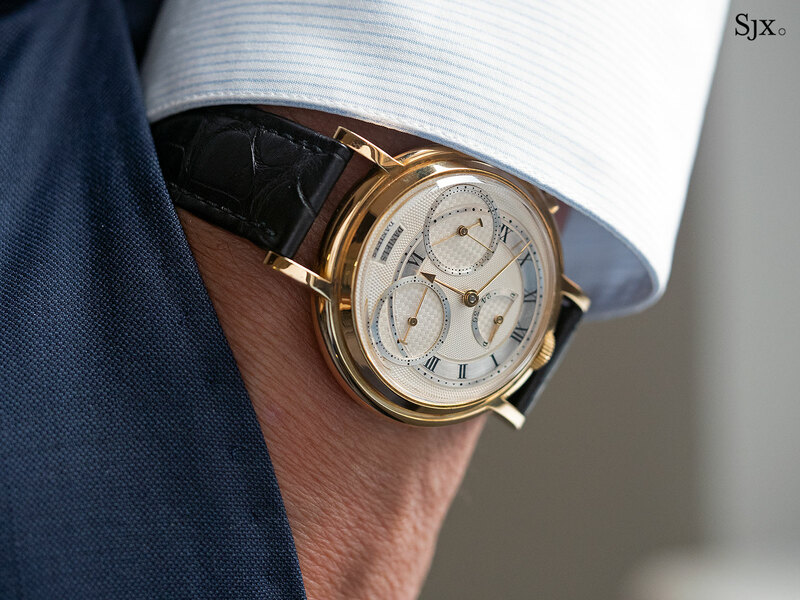 That’s especially so given that Dr Daniels was already 65 years old when he completed the watch in 1991. 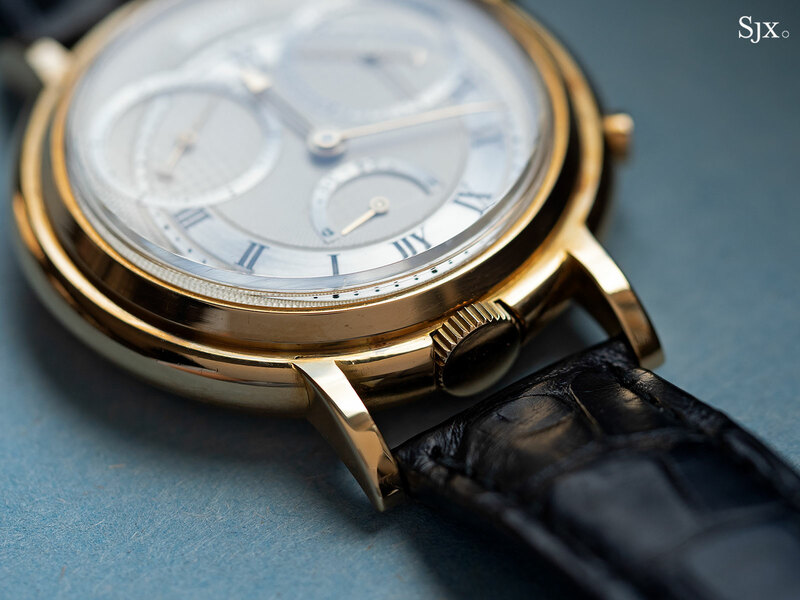 Only after Dr Daniels’ death was was the watch sold at Sotheby’s in 2012 for £385,250, or US$617,594, to the current owner. 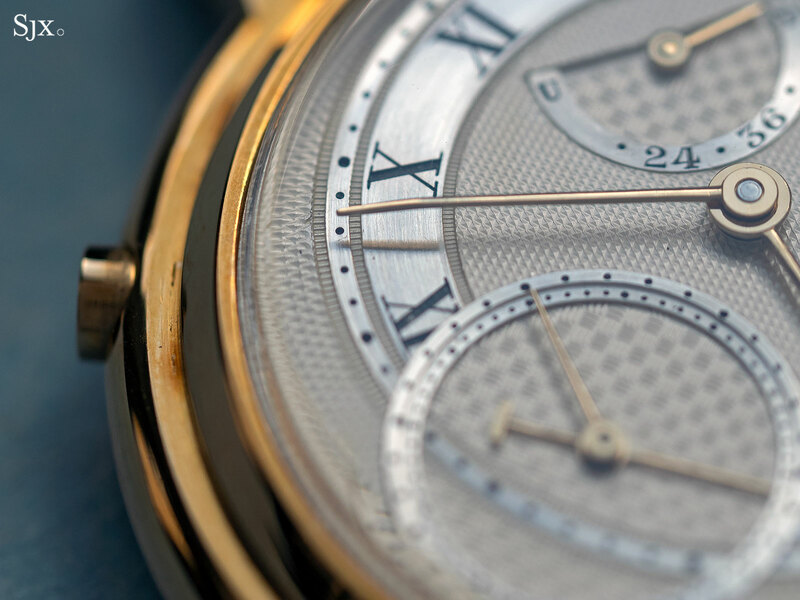 A large sum, but one that in hindsight seems like a bargain since the Space Traveller pocket watch sold for just over £3.2m last year. 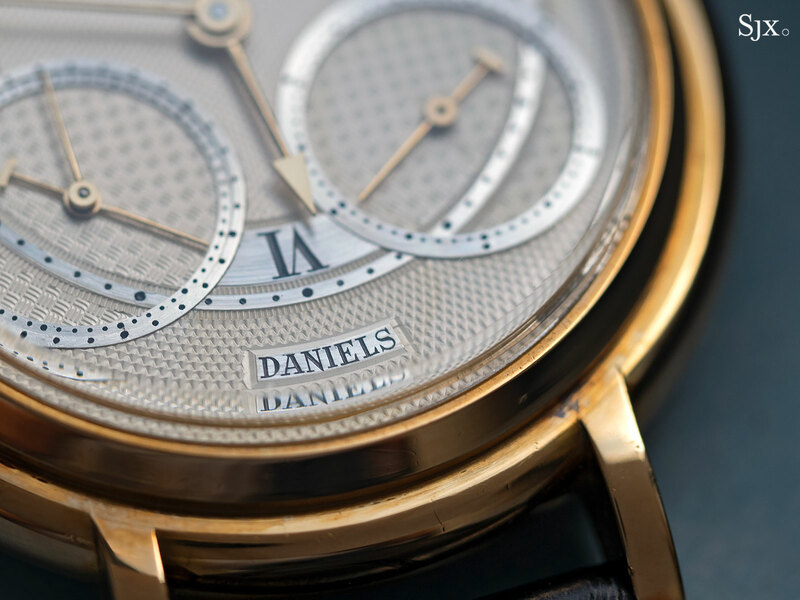 The watch is physically impressive, being the largest Daniels wristwatch ever made. 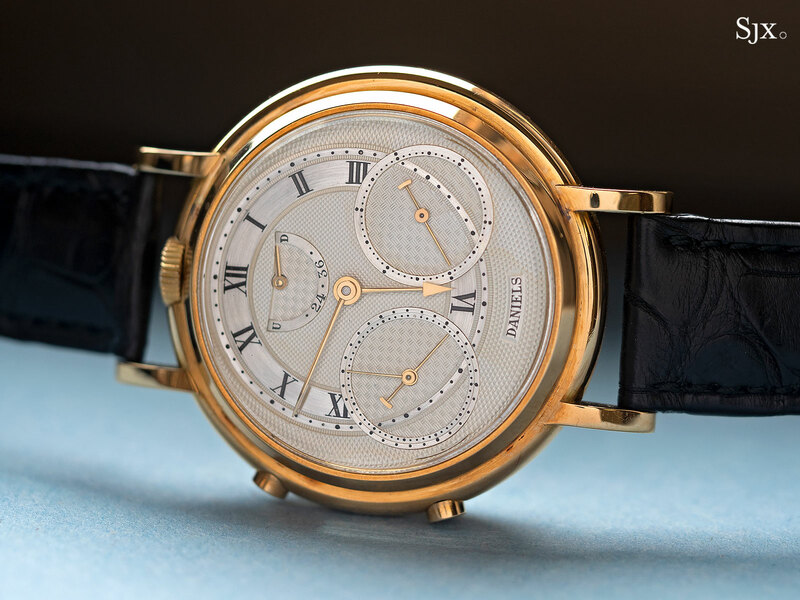 At 42mm in diameter it’s considerably larger than the Millennium, which was 36mm, and the 40mm Daniels Anniversary. 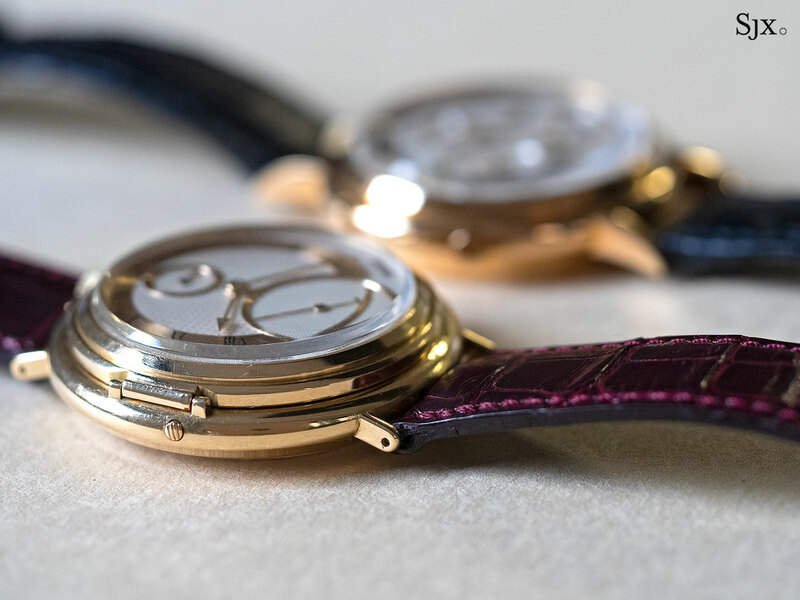 The diameter is identical to that of the later Spring Case, though the Chronograph Wristwatch feels larger due to its wider and longer lugs. 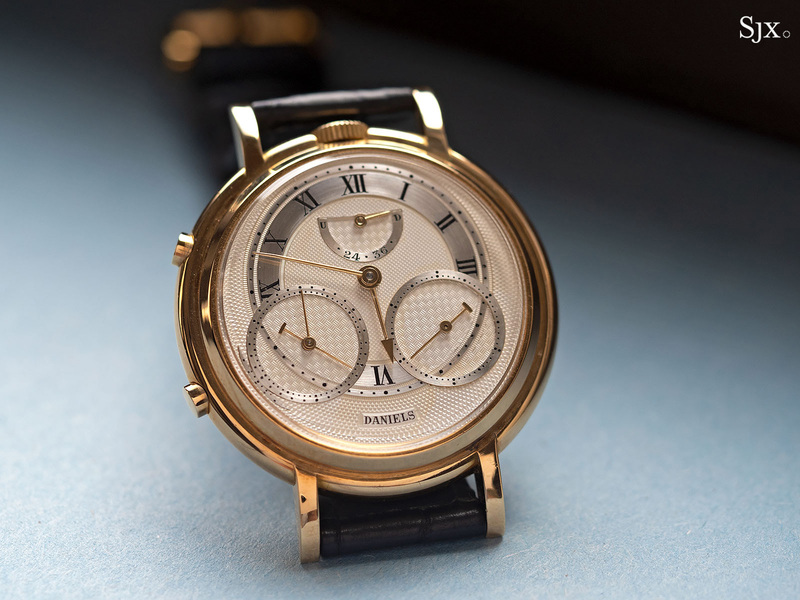 While the case sets it apart from other Daniels wristwatches, the dial and hands are quintessential Daniels style. 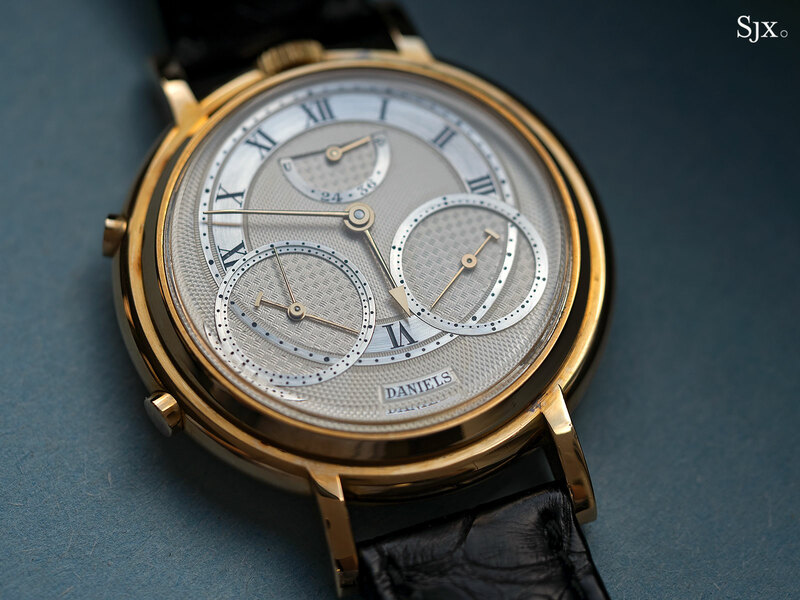 Despite the classical, Breguet-inspired style, the dial is eminently functional and sensibly laid out, as was typical of Mr Daniels’ work. 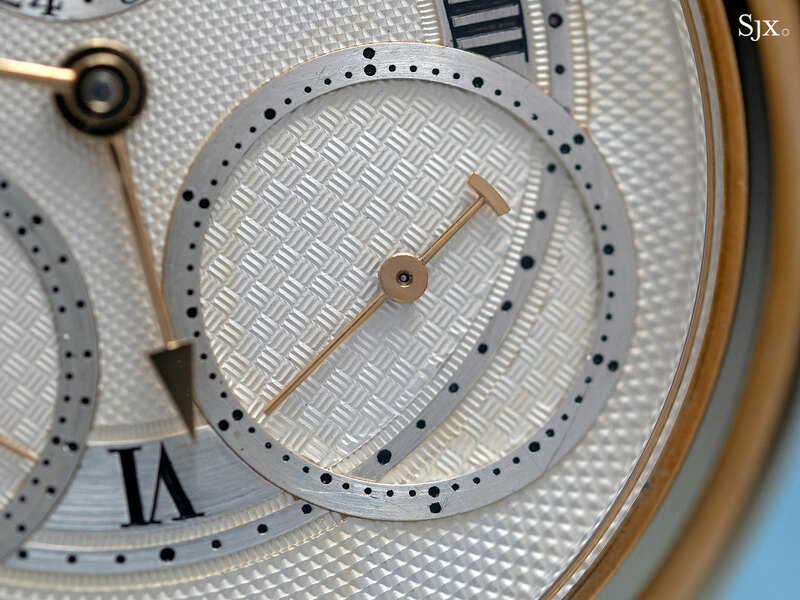 The dial is solid silver and engine-turned, with each of the sub-dials being separated pieces attached to the main body. All of the markings are hand-engraved and filled with black lacquer. And the hands are solid gold and in the Daniels-style, featuring arrowheads on the main hands and fan-shaped counterweights on the smaller hands. 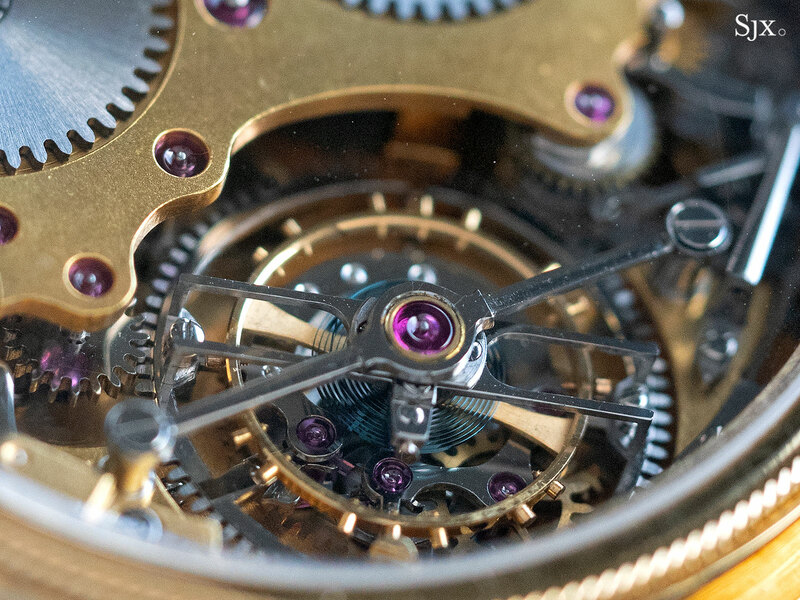 Equipped with twin barrels that give it a 60-hour power reserve, the hand-wound movement boasts two key complications – a tourbillon and chronograph – along with a power reserve indicator at 12 o’clock driven by differential screw mechanism. 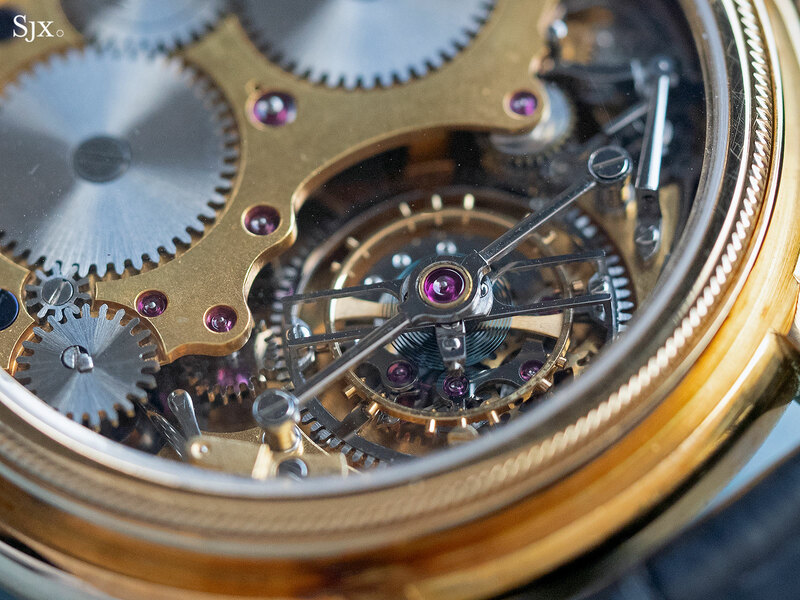 The primary complication is a four-minute tourbillon with Co-Axial escapement, similar to the one he later installed in the Spring Case. 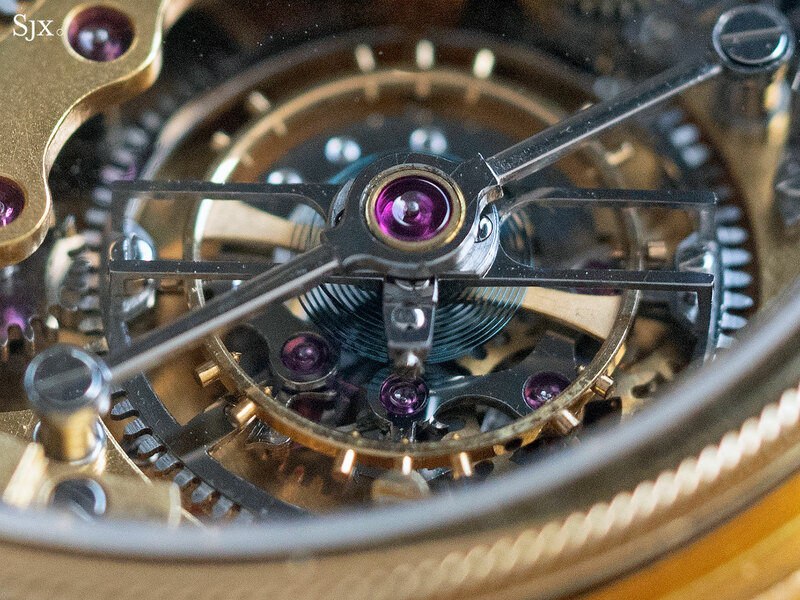 The steel tourbillon cage makes one revolution every four-minutes, a considerably more leisurely pace than the conventional one-minute, and is held in place by a polished steel bridge. 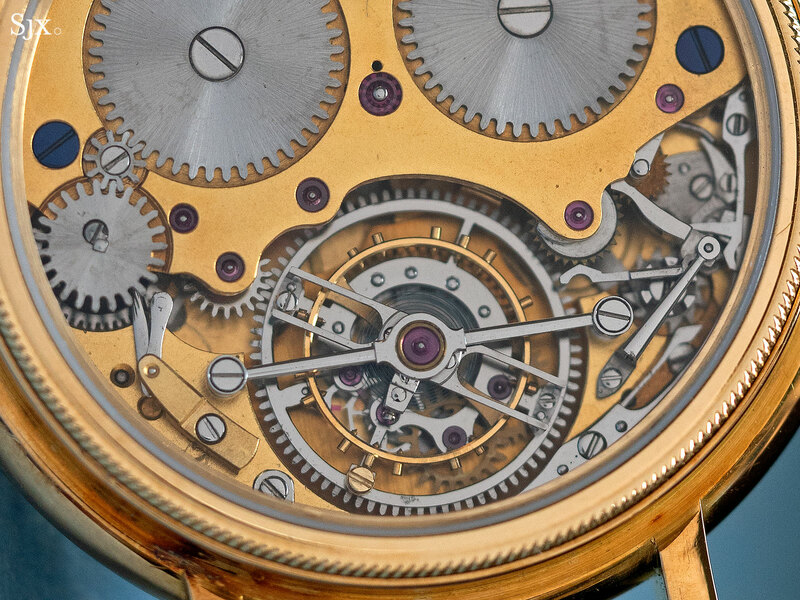 Inside the carriage is a two-arm balance with gold adjusting screws and a blued, free-sprung balance with overcoil. 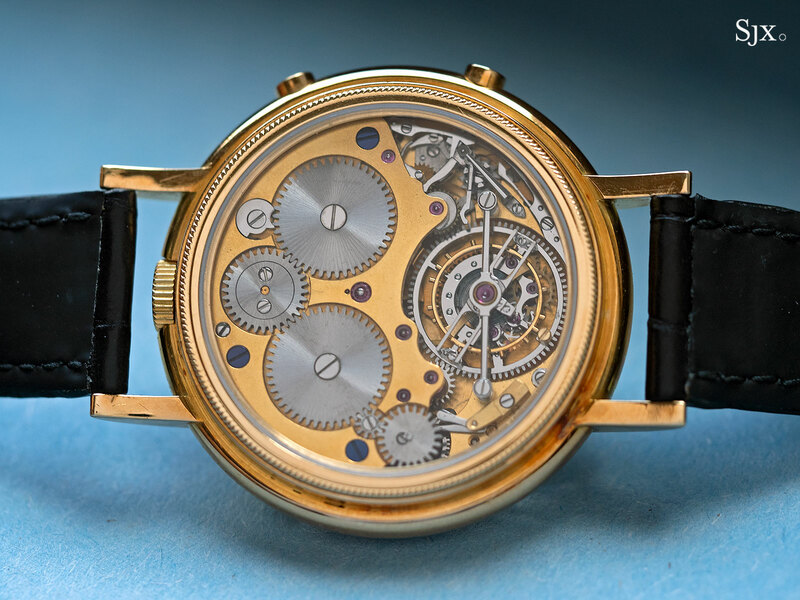 The other complication is a two-button chronograph that Mr Smith refers to above, with the elapsed seconds and minutes combined on the left sub-dial (constant seconds sits on the right sub-dial). 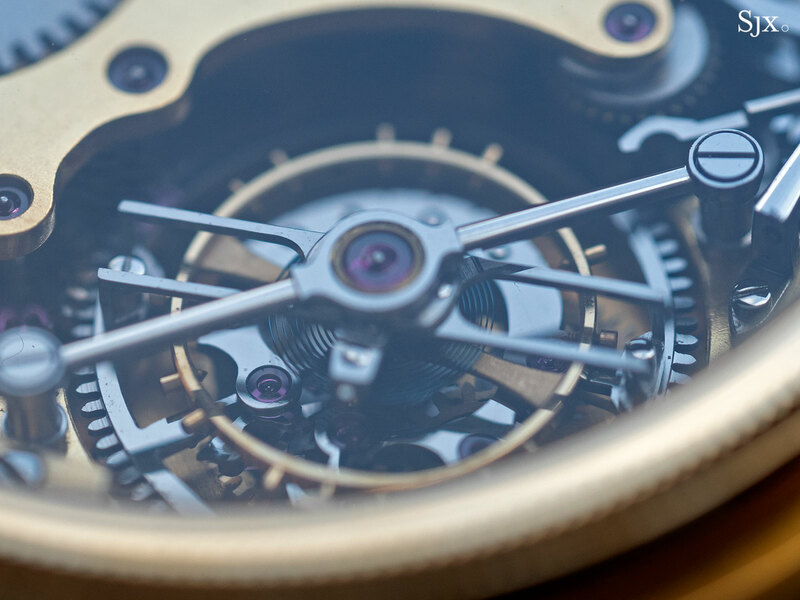 Writing in All in Good Time: Reflections of a Watchmaker, his autobiography first published in 2000, Dr Daniels described it as “an experimental chronograph”, in essence a smaller version of the compact chronograph mechanism found in the Space Traveller’s pocket watch. 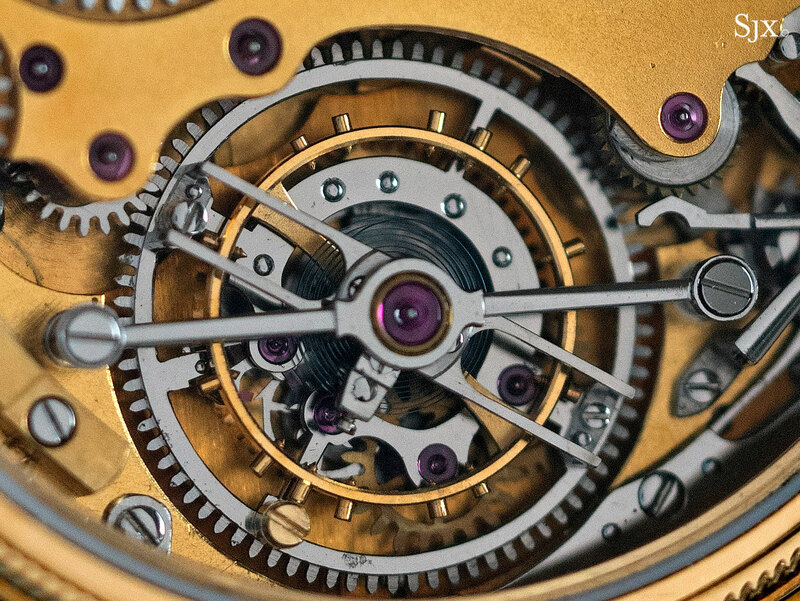 The chronograph mechanism was “[compressed] into unused space to the side of the escapement”, in order to reduce the height of the movement. 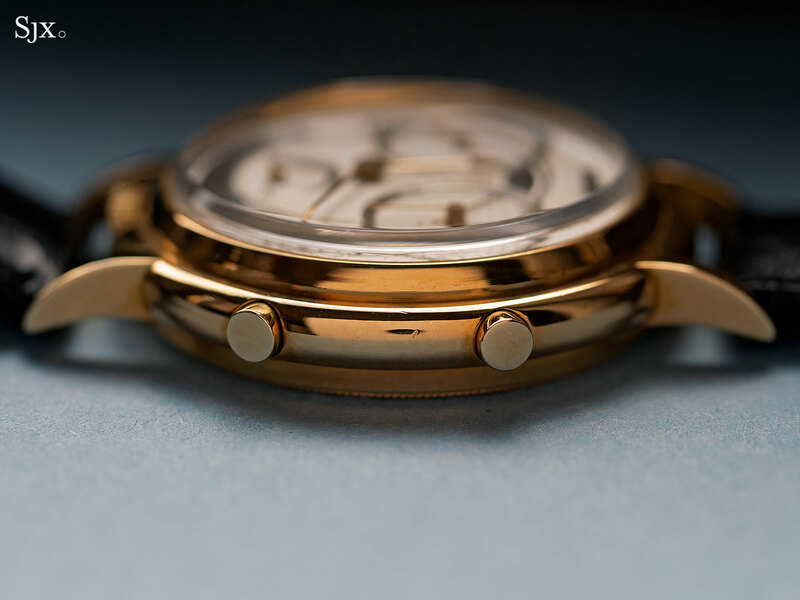 “It uses a clever clutch type system which engages and disengages the chronograph function from the going train, and was more than likely inspired by his love and fascination of the motor car,” adds Mr Smith. 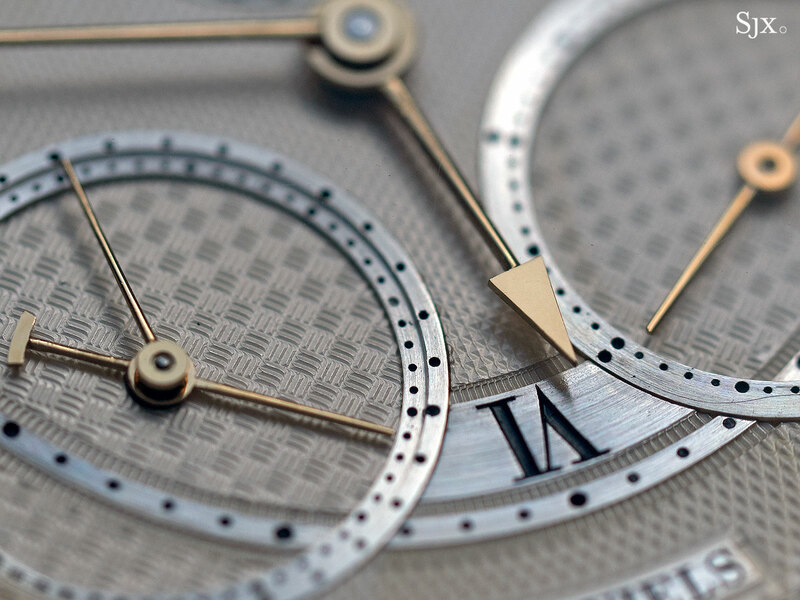 The entirety of the Chronograph Wristwatch, according to Dr Daniels, was to create a showpiece to demonstrate the feasibility of the Co-Axial escapement. 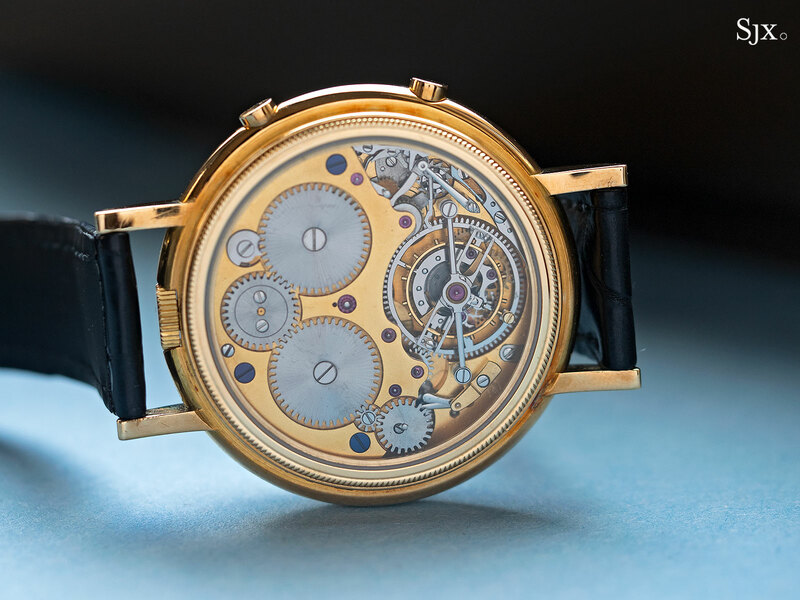 And it happened to be a wristwatch because it was “essential if I was to capture the attention of the Swiss industry”, which he was then hoping would buy the Co-Axial escapement. 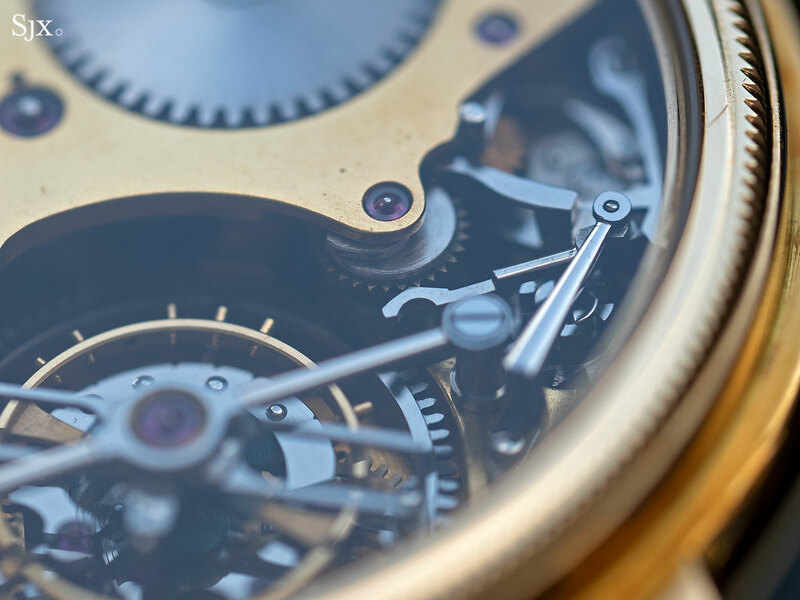 From conception to realisation, the Chronograph Wristwatch is illustrative of Dr Daniels’ technical brilliance, artful craftsmanship, and a practically minded approach to business.